The growing sea of shimmering rooftop solar panels dotting homes and businesses across San Antonio is something our entire community can be proud of, bringing, as it does, cleaner air, a reduced dependence on fossil fuels and a growing number of good-paying jobs. Today, panels on roughly 1,600 homes and businesses generate more than 15 megawatts of solar power in the San Antonio area, part of the reason we rank sixth in the nation for installed solar power. Just three years ago, only 394 rooftops hosted panels. That’s a 400 300 percent increase. CPS Energy is proud of its role in the growth of rooftop solar, and we want to see that growth continue in a way that’s sustainable for all our customers – even those unable to take direct advantage of it. As others have noted, the explosive growth of distributed generation is one of the forces disrupting what has long been a static industry; indeed, utilities have worked under the same business model for more than a century. Today, however, they’re faced with demand to create an Internet-enabled grid, ramp up energy efficiency and figure out how to integrate more clean, renewable energy – both into the grid and into new business models. As President and CEO Doyle Beneby said in his keynote at the Austin Electric Conference on April 6, utilities can fight those changes or figure out how to stay relevant. CPS Energy, he made very clear, is choosing the latter path. The coming changes are recognized as disruptive for a reason. The transition will almost surely not be a smooth one. No one knows exactly what the successful utility business model will look like in the future, and many companies across the country are testing a variety of models – and none are likely the final answer, as technologies continue to change. CPS Energy is committed to figuring it out, however, with the understanding that during the transition, we must continue to provide affordable, reliable power to our entire community. The exponential growth of solar comes from a confluence of factors: the rapidly dropping price of solar systems, a generous rebate from CPS Energy plus federal tax credits, and tireless community education from the nonprofit Solar San Antonio, which has also worked to reduce barriers to financing. Solar allows customers to drastically reduce their energy bills. But the way utility rates are currently structured, CPS Energy doesn’t recover its cost of service from those customers. That cost includes maintaining the electrical grid, which solar customers still rely on to power their homes when the sun is not shining and to take any excess power their panels may generate. And CPS Energy is doing more than just maintaining the grid. We’ve just begun a $290 million upgrade that will give it 21st century communication capabilities, increasing reliability, boosting efficiency and better able to integrate ever larger amounts of solar power into the system. 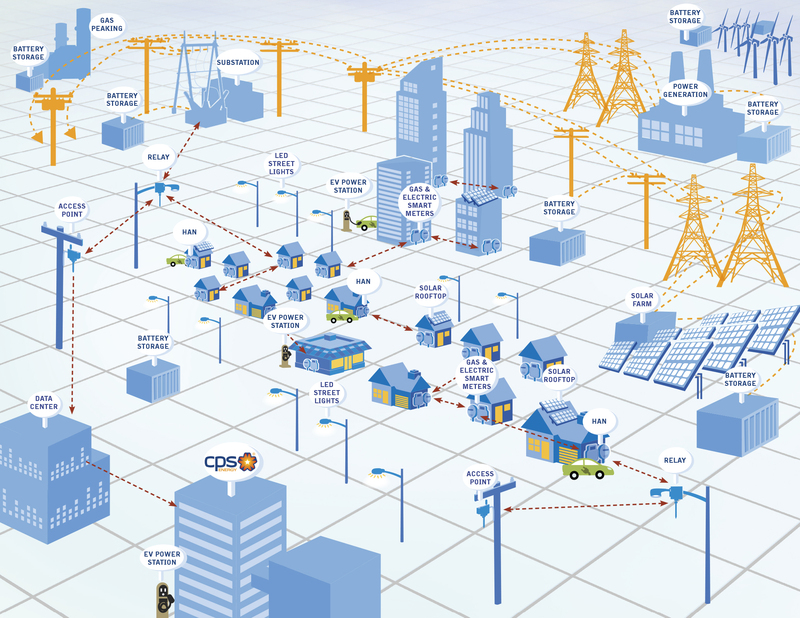 The smart grid will allow CPS Energy to better integrate solar power into the grid. Subsidies for rooftop solar were never meant to be permanent, and as the price of solar has dropped, CPS Energy has reduced its rebates – but they’re still some of the most generous in the country, and the industry still relies on them to reduce the payback time of a system for potential customers. But the existing system of subsidies plus retails rates for net metered power is unsustainable at the pace solar rooftop is growing, for CPS Energy (400 percent over the last three years), and across the country. Pitched battles have taken place in state after state as competing interests clash over the most equitable way forward. Last year CPS Energy proposed a change from net metering to a market-based rate. It was met with considerable protest by the solar community, so we opted to keep the current system in place while we studied the issue further and sought input from a variety of stakeholders, including local solar installers, a range of customers and other community leaders. After a year of study, CPS Energy has decided to keep the current net metering system in place. We will also commit another $20 million to solar rebates. That’s on top of the more than $30 million we’ve paid out thus far. The money will continue to come from CPS Energy’s Save for Tomorrow Energy Plan, which seeks to reduce energy consumption through a variety of rebates, efficiency measures for homes and businesses, and other programs. The $20 million will be reallocated from other STEP programs. As the cost of solar continues to drop, the rebate will be reduced over several years. 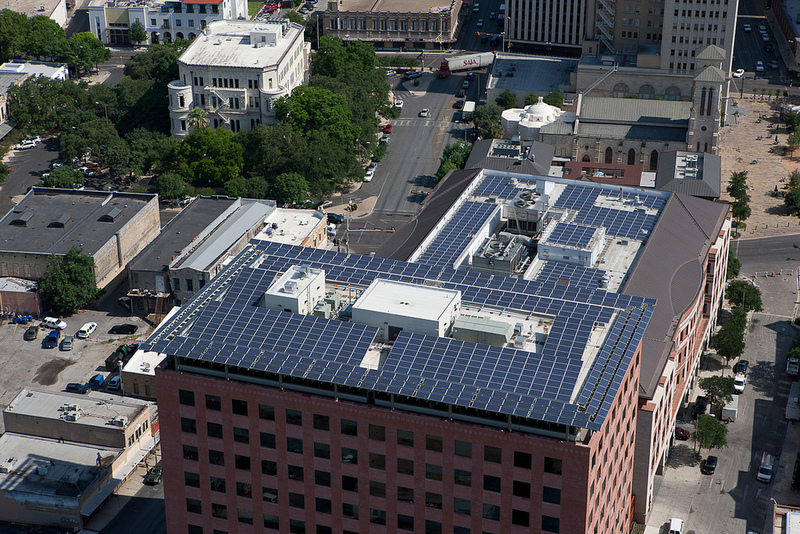 The 200 kW solar pv system on the roof of Bexar County’s Paul Elizondo Tower. Instead of cutting the net metering rate, we are proposing a fee that will allow us to recover the cost of maintaining and upgrading the grid – again, a grid everyone still relies on. This will include a one-time connection fee for solar installations, and a small monthly grid fee based on the size of the solar system. To make solar available to even more customers, we’re also excited to share that CPS Energy is working on a community solar program. Community solar is growing in popularity around the country and allows many more customers access to solar: those who can’t afford their own system, who rent, or whose own rooftops are not suitable for a system. While the launch of that program is still some months out, we are working now to finalize our new distributed solar plan, and hope to announce details soon. We’re committed to not just supporting the continued rapid growth of rooftop solar in San Antonio, but also to explore new business models that would allow CPS Energy to be an active participant in the distributed solar market. if you had 394 solar installations 3 yrs ago and 1600 now, that is a 300% increase, not a 400% increase. Rounding to 400 installations, a 100% increase doubles to 800 installations, a 200% increase triples to 1200 installations and a 300% increase quadruples to 1600 installations. The operative word is “increase”. You are so right! Thank you for catching my mistake. I will fix it in the body of the blog post.